OCCU and KUGN want to send you to to Arizona to watch your Ducks in style! 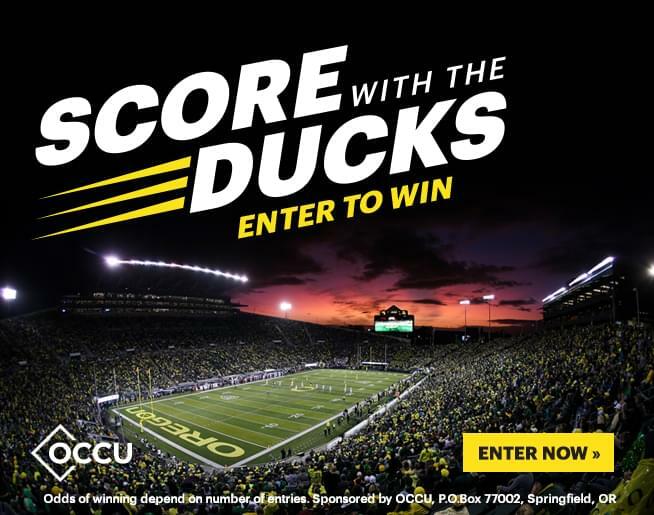 September 1 and through September 28, if you use your OCCU Duck Card on ANYTHING then you have a chance to win an all expenses paid trip to the desert to watch Oregon face Arizona on October 27. The grand prize winner gets two tickets to the game, two round-trip airline tickets, two nights at a Tuscon-area hotel, food and drink, transportation around town, and access to the UO Alumni Association Tailgate Party. And all you have to do is click HERE and register. Each existing customer gets one free entry when they register, but a non-card holder can maximize their one entry to 10, and get 10,000 bonus reward points on the card! The OCCU Duck Card has amazing benefits, which includes your choice of travel, cash, and merchandise reward, and bonus points for purchases made on Duck tickets or merchandise. Just what every diehard Duck fan needs! Contest open to legal residents of the U.S. & D.C. 18 years of age & older. Contest begins at 12:00:00 PDT on September 1, 2018, and ends at 23:59:59 PDT on September 28, 2018. No purchase necessary to enter or win. Odds of winning depend on number of Entries received. To enter and for full Official Rules, go to http://MyOCCU.org/ducks-soar/rules. Void where prohibited. Sponsor(s): OCCU (Oregon Community Credit Union, OCCU Card Services, LLC).